A fish jumps out of the water. The movement breaks the otherwise still mirror-like surface of the Shimanto River, here in the Kochi prefecture of Japan. The ripples radiate out from where the fish had broken the surface and then everything becomes still once more. Reflected in the water surface are the pebbly beaches on one shore, the rock escarpment on the other, and the dense forest that grows up to the top of the hills around us. I’m in a kayak, slowly paddling my way down the Shimanto River. Alongside me is Yuta Taniyoshi, who runs a small business taking visitors on trips down the waterway. Yuta grew up around here and he knows the twists and turns of the river like someone might know their local shopping street or regular dog-walking path. He warns me when there are some rapids coming up and we rush down them with a bit of a thrill. 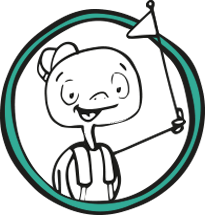 Yuta runs the business, called withRiver, from his home beside the river, where he lives with his young family (and his cats, Panda and Roller). There aren’t many other people around – which is actually no great surprise. Of Japan’s 47 prefectures, Kochi has the fourth-lowest population density. Paddling along, it’s clearly more than just a statistic. You feel quite alone out in the nature here, with the scenery and the animals the star attractions. Outside of Kochi’s cities, there’s a stunning tranquility that you normally don’t get in Japan’s main hotspots. That’s one of the joys about exploring a prefecture like Kochi, away from the tourists, with these unexpected treasures. Although Yuta offers a free pick-up service from the nearby Shimanto City for anyone who wants to go kayaking, I’ve decided to hire a bike for the afternoon and cycle out to his house. From Shimanto City, you just follow the river. There are roads on either side and I go there along one and then come back along the other. It gives me different perspectives of the hills and the forests, the sun glistening off the water, with the occasional sightseeing boat puttering past. 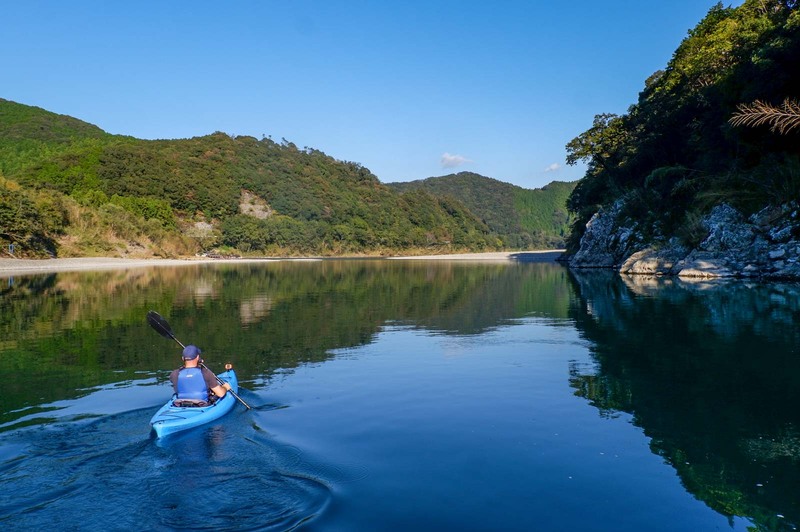 The island of Shikoku has an incredible range of sceneries and – just as an aside – is a really underrated part of Japan that’s always a wonderful surprise for tourists who come for a visit. Each of the island’s four prefectures is stunning in its own way but Kochi, as the largest and least-populated, is extra special for nature-lovers. 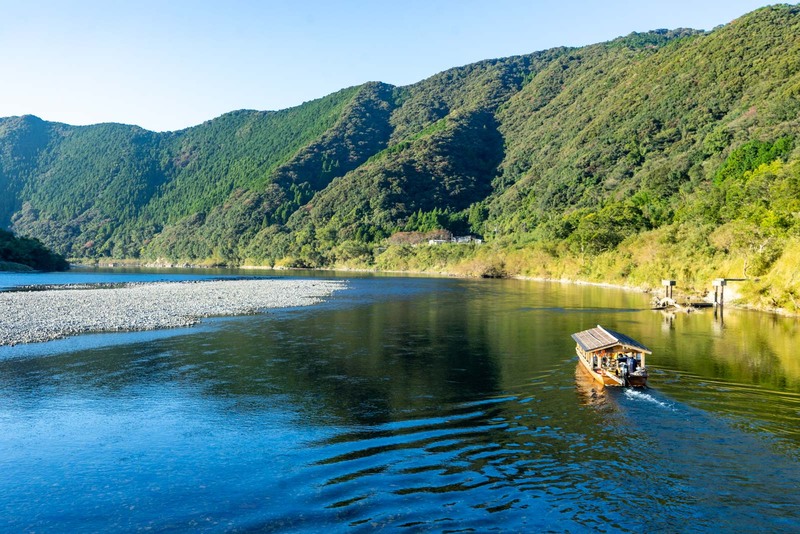 Basing yourself in Shimanto City, you can explore the Shimanto River which, at 196 kilometres, is Shikoku’s longest river. It’s also considered to be Japan’s last ‘clear stream’, meaning it’s the only one that is still pure and uncontaminated by any industry. But Shimanto City is also the perfect base to venture a little further afield to see some of the other natural sights in this part of Kochi. I think the best area to go is the southernmost region of Tosashimizu. There are a lot of things to see in Tosashimizu but I would suggest to make a priority of the Tatsukushi Coast. This fascinating coastline is famous for its strange rock formations that seem to defy gravity, leaning and twisting as they stretch out from the sea to the forests. The geological formations here were created at least 15 million years ago by ancient earthquakes and have fossils of sea creatures captured inside. As I climb over them and walk along the coastal path, the shapes seem to come alive, telling me the story of the land and the water. You can get to the Tatsukushi Coast on a glass-bottomed boat that will stop in a few coves along the way, giving you the chance to see the schools of tropical fish that live in this area. Once you get to the coastline, there’s a path along the water and then back over a hill that will take about an hour but show you all the best spots. In fact, the water the flows past here is famous in its own right and the Japanese have given it a name – the Kuroshio Current. The strong and deep current is important because it carries large schools of fish that local fishing industries will catch and then sell to restaurants across the country. The Kuroshio Current has a large effect on the biodiversity beneath the surface here and, for more years than any of us can count, has affected the geological shape of the coastline. There’s now a push to designate the area officially as the ‘Tosashimizu Geopark’ and a lot of work is going on behind the scenes to make that happen. 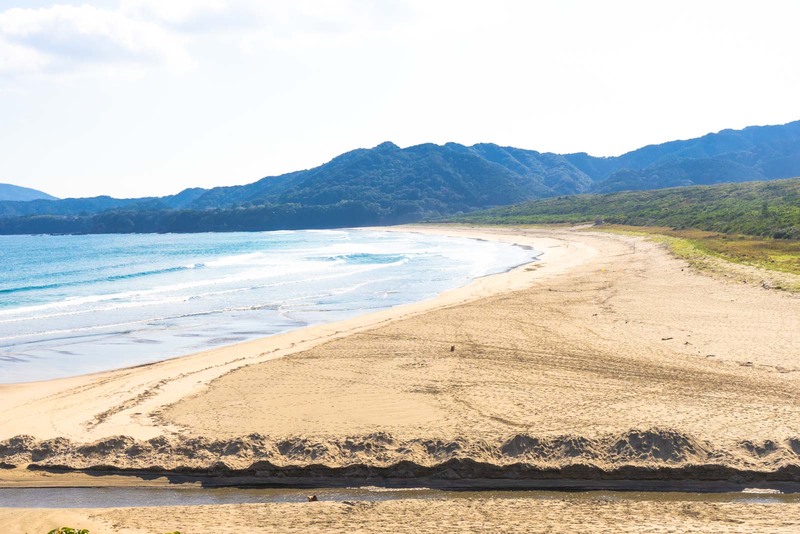 One of the other important sites in the area that would be included in the official geopark – and somewhere I would certainly recommend you visit – is Cape Ashizuri. Cape Ashizuri the the southernmost point of Shikoku island. From a viewpoint at the tip, you get an incredible panoramic view of the ocean, spread out in front of you for about 270 degrees. The cliffs here are a bright white, made from granite that is about 13 million years old and was formed by volcanic magma coming up from the seabed. If you walk for about ten minutes along the clifftops, you’ll get some lovely views back to the tip of Cape Ashizuri. Here on the cape, nature and culture meet. 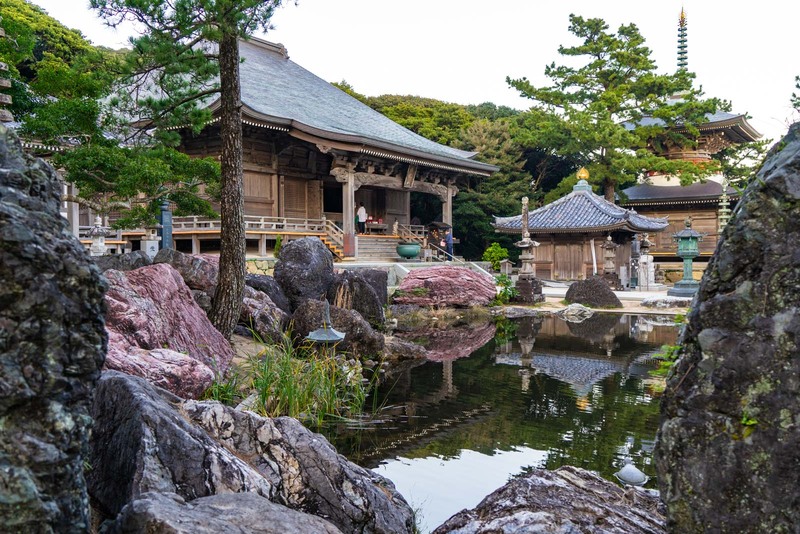 For centuries, this has been a spiritual place for the residents of Shikoku and it’s best represented in the Kongofuku-ji temple. This Buddhist temple was founded in the 9th century AD and is an impressive complex of buildings. In front of the main hall is a large pond with a beautiful pagoda on the other side. Around the site are hundreds of stone Buddha statues. Kongofuku-ji is one of the temples on the famous Shikoku 88 Temple Pilgrimage. It also has the distinction of being the hardest one to reach because it’s at least 70 kilometres walk to the one before or after it. Thankfully you don’t need to be taking part in the pilgrimage to visit it – and you don’t need to walk to this part of Kochi to see the nature. If you don’t have a car, I would recommend either hiring one or organising a tour or taxi to take you around for the day to see some of these very special parts of Japan. 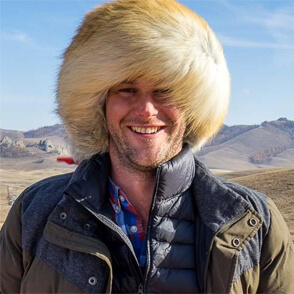 It shows you a different side of the country, something unique, and something that’s greater than man. Such beautiful landscapes! For some reason when I think about Japan, I don’t think of nature. I clearly should though!